Laminoplasty describes the process of increasing the space available for the spinal cord by reconstruction of the laminar arch via a posterior approach. Laminotomy  is the surgical removal and subsequent reinsertion of laminae and spinous processes, whereas laminectomy represents the removal of the lamina and the spinous process. The term laminotomy is often incorrectly used to describe a partial laminectomy. A partial or hemilaminectomy is the removal of the lamina on one side, starting from the medial aspect of the facet joint to the lateral aspect of the base of the spinous process, usually without removal of the spinous process itself. For each of these procedures, a plethora of technical modifications have been proposed. This topic describes the most commonly performed techniques of laminoplasty in the cervical and thoracolumbar spine. The definitions of Yucesoy and Sonntag  were used for this chapter, as described in the table below. An asterisk represents the authors' modification. The marked boxes represent areas with significant overlap and inconsistency in terminology. The cervical spine is made up of 7 vertebrae. The first 2, C1 and C2, are highly specialized and are given unique names: atlas and axis, respectively. C3–C7 constitute subaxial cervical vertebrae, having a body, pedicles, laminae, spinous processes, and facet joints. The cervical spine is more mobile than the thoracic or lumbar regions of the spine. Unlike the other parts of the spine, the cervical spine has transverse foramina in each vertebra that bear the vertebral arteries usually in segments C1–C6  that supply blood to the brain. The spinal cord is located inside the vertebral canal, which is formed by the foramina of 7 cervical, 12 thoracic, 5 lumbar, and 5 sacral vertebrae, which together form the spine. The spinal cord extends from the foramen magnum down to the level of the first and second lumbar vertebrae (at birth, down to second and third lumbar vertebrae). For more information about the relevant anatomy, see Cervical Spine Anatomy and Topographic and Functional Anatomy of the Spinal Cord. The most common indications for laminoplasty are shown in the table below. A surgical microscope should be used to improve visualization when working in proximity of the spinal canal. Throughout the procedure, meticulous hemostasis is achieved with bipolar cautery and hemostatic material. Epidural bleeding is usually well controlled by gelatin foam. The risk of postlaminectomy instability is highest in the cervical spine and lowest in the lumbar spine. Because no randomized controlled trials comparing laminectomy to laminoplasty exist, the potential for postlaminectomy instability is discussed below to provide assistance in decision-making. Compared with the cervical spine where the posterior elements are exposed to most of the loading stress, the load axis of the thoracic and lumbar spine shifts anteriorly. As a consequence, procedures performed on the posterior elements in the lumbar spine may have a less immediate and dramatic effect on the spinal curvature. The incidence of postlaminectomy deformity in the thoracic spine is low, as long as more than 50% of the facet joints are left intact. Aizawa et al found progression to kyphosis of 2.5 degrees per level in women and 0.6 degrees in men after a minimum of two years' followup after thoracic multilevel laminectomy. Patients may perform activities of daily life but should refrain from major physical activities until 6 weeks after surgery. They should be counseled on an individual basis regarding their ability to return to their previous occupation or physical activities. Patients are instructed to see a healthcare specialist if preoperative symptoms recur or new symptoms develop. The authors use fluoroscopy to verify that the incision is placed above the targeted segments. Once the spinous processes have been exposed and retractors are in place, another intraoperative fluoroscopy shot is obtained to document exposure at the intended levels. In case of compression-induced myelopathy or cervical spinal instability, the surgeon should discuss the need of awake-fiberoptic intubation to prevent neurological injury due to hyperextension of the neck. Analgesia is identical to other types of spinal surgery. Sufficient room for chest expansion should be secured; appropriate padding is required. Abdominal compression in the ventral position should be avoided, using adequate cushions to improve venous return and allow for bloodless surgery. In cases with severe spinal cord compression or if spinal cord injury with ischemia is suspected preoperatively or perioperatively, blood pressure should be maintained within 10-20% of preoperative values. For cervical laminoplasty, the patient is placed in a prone position, and the chest is padded and the head is fixed using a Mayfield headholder in slight forward flexion (“military chin tuck”). Sufficient space is left between the chin and the chest to allow for adequate venous return. Some surgeons have suggested releasing this slight forward flexion during surgery once decompression is achieved to adapt osteosynthesis to the cervical lordosis. For thoracolumbar laminoplasty, the patient is placed in a prone position. For lumbar procedures, the arms can be placed parallel to the torso pointing cephalad to allow the surgeon comfortable access to the situs. For thoracic laminoplasty, the arms are placed lateral to the torso and point caudally. The anesthesiologist should be allowed comfortable handling of the venous lines, oxygen saturation, and blood pressure instruments. Appropriate padding is provided to chest and abdomen to avoid compression. Unless neurological deficits exist, patients are asked to walk on postoperative day 1 and adequate physiotherapy is prescribed to improve neuromuscular function. Particularly in the cervical spine, operated segments should be allowed time to heal. Therefore, in children and adults, the authors recommend a 6-week immobilization using a rigid collar or brace for less axial neck pain and to allow for healing of the repositioned bone material. However, a postoperative rigid cervical collar has no impact on complications or quality of life. [48, 49] Adults therefore may not formally require a brace or collar, but may be offered a soft collar for 1–4 weeks. Wound care and analgesics are administered according to standard protocols. Patients undergo imaging as required for their main diagnosis (eg, follow-up magnetic resonance imaging for tumor or plain radiograph for fusion success after laminoplasty). The authors recommend performing anteroposterior and lateral radiographs of the cervical spine after 6 weeks. The goal is to assess whether the cervical curvature has changed after surgery. Also, lateral radiographs provide information on the space available for the cord. Computed tomography with high-resolution or three-dimensional reconstruction is most helpful in the identification of osseous compression, deformity, bone quality, and construct failure. Moreover, restenosis is a potential late complication due to bony compression, which needs to be excluded by imaging in case of symptom recurrence. Axial neck pain is a common postoperative complication of cervical laminoplasty. [54, 55] Temporary axial neck pain occurs in up to 60% that decreases significantly within 6 weeks and one year postoperatively. Shoulder pain also occurs commonly, often ipsilateral to the hinged side. If the usual pain medication including anti-inflammatory drugs and opiate drugs fail to alleviate the pain, imaging is indicated to exclude spinal instability, postoperative hematoma, and cord or nerve compression due to bony spurs or osteosynthetic material. Intraoperative lateral fluoroscopy, solid osteosynthesis, flattening of the ventral surface of the laminae and, finally, fascial closure with deep sutures involving the spinous processes are necessary to prevent “sinking” of the laminotomy flap, which may cause a mass effect. Postoperative deficits should always prompt urgent imaging to exclude postoperative cord or nerve root compression due to bone or an epidural hematoma. After fluoroscopic verification, the skin incision is performed in the midline, about 2 cm above the most cephalad down to the level of the most caudal exposed spinous process and continued sharply through the subcutaneous fat. Midline orientation is kept by palpation of the spinous processes and identification of the white nuchal ligament. The nuchal ligament is incised strictly in the midline using monopolar cautery to preserve its muscle insertions (from superficial to deep: trapezius [upper fibers], rhombdoid minor, splenius capitis, and serratus posterior superior). Care is taken to stay on the lateral aspect of the spinous process and perform dissection only along a corridor of bony resistance. Any force applied to the laminae is directed laterally and not downwards to prevent impaction into the spinal canal due to fragile bone or spina bifida. Cottonoids are applied for more gentle muscle handling and can be temporarily left in place on one side for hemostasis during contralateral dissection. Dissection should be sufficiently lateral to visualize the medial half of the facet joints (see the image below) while avoiding penetration of the facet capsule. Cervical laminoplasty is presented on a sawbone model of the cervical spine. A: Levels C3 to C7 are exposed. B: For a C4-6 laminoplasty, the inferior aspect of the lamina of C6 is undermined using a Kerrison punch to create an entry for the craniotome (arrow). C: A temporary longitudinal miniplate (arrow) is applied as medially as possible on the laminae to preserve the physiological alignment. D: Once the troughs are cut, the laminar flap can be removed. E: This figure demonstrates a left open door laminoplasty, the spinal canal is opened only on one side. Some authors suggest to place a bone wedge (eg, rib or spinous process, represented by the red rectangle) between the opened laminar arch and the lateral mass (arrow) in order to maintain curve of the laminar arch. F: Final result of a bilateral miniplate laminoplasty. The miniplates are attached to the center of the dorsal surface of each respective lateral mass. Prior to reinsertion of the flap, osteotomy of the ventral aspect of the laminae is performed (not shown) to maximize the space available for the cord. Visualization of the facet joint can be obtained by carefully shifting two adjacent spinous processes against one another. This maneuver produces bulging folds in the capsule of the facet joint, which represent a useful landmark. Spinal retractors (or cerebellar angled retractors) are then placed and fluoroscopy is used for verification. The inferior border of the lowest lamina is identified using a Penfield no. 1 dissector. Careful undermining should expose its inferior aspect. Medial to the facet joint and lateral to the insertion of the spinous process, a few millimeters of bone are removed on each side with a Kerrison punch to create an entry point for the footplate of the drill (see the image above). The laminar arches can be temporarily connected using osteosynthetic plates (see the image above). This temporary maneuver prevents shrinking of the construct and facilitates its reimplantation after laminotomy. The plates can be removed after reinsertion (see the image above). The ligamentum flavum is left in place for protection until the bone work is done. A craniotome or drill is then used to draw through along a line just medial to the facet joints and parallel to the spinous processes. It is not unusual to find insurmountable resistance when initiating the bone cut using a craniotome. If angulation of the craniotome laterally and posteriorly does not lead to a cut in the desired direction, one should not apply force but rather abandon this technique. Instead, a rose burr (2 mm or 3 mm) should be used to drill a trough into the lamina just medially to the facet joint (see the image above). Once the inner cortical layer is reached, a diamond bur is used to progressively thin out the laminae. Irrigation is applied copiously to reduce heat transduction to nervous tissue. The trough can be completed with a Kerrison punch. Next, four variations of laminoplasty are described: Z-laminoplasty, hinged-door laminoplasty, midline-enlargement laminoplasty, and the bilateral miniplate laminoplasty. In Z-laminoplasty, the spinous processes are removed and the laminae thinned using a diamond burr. The laminae are split in a transverse direction and reapproximated in an augmented fashion using nonresorbable sutures (see the image below). Four different types of laminoplasty are depicted schematically. A: The Z-laminoplasty was the first laminoplasty technique, developed by Hattori in 1972. Using a posterior midline approach, the spinous process is removed while leaving the lamina mostly intact. The laminar arch is split in the horizontal plane to produce one flap on each side. The flaps are hinged open and fixed. While this is a technically difficult method, it has led the way for the development of several other techniques. B: In the hinged-door laminoplasty, only one side of the laminotomy troughs is opened and the laminae are hinged to one side. The hinge is left on the side where one anticipates the lesser need for decompression, i.e. contralateral to the main symptoms in case of lateralization or contralateral to a potential foraminotomy. Holes are drilled through the lateral mass of the hinge-side and a non-resorbable suture maintains lateral retraction of the hinged laminae. An interposition graft (rib, spinous process) can be used as a spacer and can be wedged between the medial part of the lateral mass and the laminae. C: In the midline-enlargement laminoplasty, both lateral troughs are drilled without penetrating the inner cortical layer of the laminae. The principle is to use the lateral troughs as hinges and split the lamina along the midline. The spinous processes can be divided with a drill or saw. Once the spinous process is split, the hemi-arches are reflected laterally to each side. A ceramic, hydroxyapatite or bone graft is wedged into place and secured into place to keep both laminar wings apart. D: The bilateral miniplate laminoplasty is based on a bilateral opening of the laminar trough. The arches are removed for reconstruction with osteosynthetic miniplates. The laminotomy block can be removed to allow access the spinal canal for further decompression. After trimming the anterior border of the laminar arch (shaded area), the flap is secured to the lateral masses using miniplates. The cephalad and caudal ends of the flap are sutured to the supraspinous ligaments. It is possible to open only one of the laminotomy troughs and to hinge the laminae open to one side (see the image above). The hinge is left on the side, where one anticipates the lesser need for decompression (ie, contralateral to the main symptoms in case of lateralization or contralateral to a potential foraminotomy). In the midline-enlargement laminoplasty, both lateral troughs are drilled without penetrating the inner cortical layer of the laminae. The principle is to use the lateral troughs as hinges and split the lamina along the midline. The spinous processes can be divided with a drill. A dissector is placed under the lamina in a caudate to cephalad direction for protection during drilling. In this technique, the laminae are opened on both sides and the arches are removed for reconstruction with osteosynthetic miniplates (see the image below). Both laminotomy troughs are cut through. Then, the interspinous ligament of the most caudal vertebra is divided using scissors or a scalpel. The assistant lifts the spinous process of the lowest vertebra under slight tension to allow the surgeon to perform a dissection of the ligamentum flavum, bridging vessels and dural adhesions while the laminar arches are progressively lifted en bloc. Depending on the type of procedure, the most cranial interspinous ligament can remain attached in situ. The laminotomy block can be reflected upward when both troughs are cut or reflected laterally when a hinge is performed. In cases in which temporary access to the spinal canal is needed (eg, in tumor surgery), the laminar arches may be buried between the spinal retractor and the laterally displaced paraspinal muscles until the intraspinal part of the surgery is completed. The laminar flap is prepared using titanium miniplates, which reach sufficiently lateral to be attached to the lateral masses. [73, 74, 75] The anterior aspect of the laminae is thinned as much as possible to increase the space available for the cord and avoid restenosis. Once the laminae are reinserted and screwed into place (see the image above), the stability of the construct is tested by manual manipulation. A dissector is used to check that the space underneath the reimplanted laminae is not in direct contact with underlying structures. The temporary longitudinal miniplate is removed. A 1-0 non-resorbable braided suture can be used to attach the supraspinous ligaments on the caudal and cephalad ends of the flap to the adjacent spinous processes. Closure is performed on the fascia including the nuchal ligament using resorbable 1-0 sutures and the subcutaneous and cutaneous closure is performed as usual. An incision is placed in the midline, starting about 3 cm above the most cephalad spinous process down to the level of the most caudal spinous process and continued sharply through the subcutaneous fat. The thoracolumbar fascia is incised in the midline over the spinous processes and a meticulous subperiostal dissection is performed down to the laminae using monopolar cautery and raspatory. Any force applied on the laminae is directed laterally and not downwards to prevent impaction into the spinal canal due to fragile bone or spina bifida. Cottonoids are applied for more gentle muscle handling and can be left in place on one side for hemostasis during contralateral dissection. Dissection should be sufficiently laterally to visualize the medial half of the facet joints while avoiding penetration of the facet capsule. In the thoracic spine, visualization of the costotransverse process indicates the position of a pedicle. Self-retaining spinal retractors are then placed and a fluoroscopy image is obtained for verification of the correct level. The inferior border of the caudal lamina is identified using a Penfield no. 1 dissector. Careful undermining should expose its inferior aspect. Medial to the facet joint and lateral to the insertion of the spinous process, a few millimeters of bone are removed on each side with a Kerrison punch or shaved with a diamond drill to create an entry point for the footplate of the craniotome (see the image below). An L2-4 laminoplasty is shown on a lumbar spine model. A: First, the entry point for the footplate of the craniotome is identified on the lower aspect of the lamina of L4 (arrow) and may be widened using a Kerrison punch. B: A laminotomy is performed along the trough (dotted line) with a craniotome. Slight lateral and posterior angulation may be necessary to achieve continuous drilling. C: Prior to removal of the laminae, a longitudinal miniplate may be applied to preserve the alignment of the posterior elements. Once the laminar flap is removed, the spinal canal is widened using a drill (D) and a Kerrison punch (E) until satisfactory exposure is achieved (F). G: The laminar flap is first meticulously freed of ventral adherences and ventral osteotomy of the laminae is performed to minimize the risk of canal stenosis. Miniplates secure the flap laterally to the pars interarticularis. The ligamentum flavum is left in place for protection until the bone work is done. A craniotome or drill is then used to cut along a line parallel to the spinous processes (see the image below). Depiction of a case of thoracolumbar laminoplasty for a Th12-L1 ependymoma of the conus medullaris. A: Sagittal contrast enhanced T1-weighted MRI shows a space-occupying intradural lesion of the thoracolumbar junction. B: Following exposure of the laminae of Th12 and L1, a longitudinal trough (thin arrows) is drilled with a craniotome and the caudal and cephalad supraspinous and interspinous ligaments are bisected (thick arrows). C: The assistant progressively lifts up the laminar flap while it gently is freed from anterior adherences. D: Spinal canal exposure can be optimized as needed for tumor removal E: After removal of the tumor and watertight dural closure, the laminar flap is osteotomized anteriorly (not shown) in order to prevent iatrogenic spinal canal stenosis. Miniplates are applied laterally (arrows). The severed supraspinous ligaments are secured to the adjacent levels with braided 1-0 sutures (not shown). Often it is difficult to initiate the bone cut using a craniotome. If angulation of the craniotome laterally and posteriorly does not lead to a cut in the desired direction, one should not apply force but rather abandon this technique. Instead, a rose burr (3 mm) should be used to drill a trough into the lamina medially to the facet joint. Osteosynthetic plates can be used to link the spinous processes using titanium mesh plates prior to laminotomy to preserve the length and angulation of the spinous processes. The plates are removed once the removed laminae have been fixed back into place. The ligamentum interspinosum of the most caudal vertebra is divided sharply. The assistant holds up the spinous process of the lowest vertebra under slight tension to allow the surgeon to perform a dissection of the ligamentum flavum and dural adherences. During this procedure, the most cranial interspinous ligament can remain attached in situ. The package of spinous processes can be removed, reflected upwards, or buried between the spinal retractor and the laterally displaced paraspinal muscles until the intraspinal part of the surgery is completed. The spinal canal is inspected for bony protrusions and residual ligamentum flavum, which are removed with a drill or Kerrison punch until satisfactory exposure is achieved. See the images below. Performing a thorough thinning of the laminar flap in order to prevent an iatrogenic stenosis of the spinal canal is mandatory. The construct can be reinserted and attached to the pars interarticularis on each side using titanium miniplates as described above. 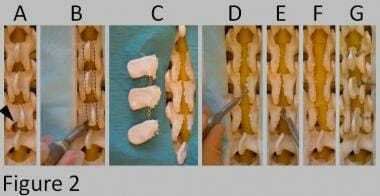 The supraspinous ligaments of the uppermost and lowermost laminae are sutured to the spinous processes of the adjacent segments using non-resorbable 1-0 braided sutures. The thoracolumbar fascia is sutured tightly to the spinous processes of the laminar flap. This additional measure prevents a sinking of the flap. In pathologies that may require repeat surgery such as tumors, some authors suggest the use of colored and nonresorbable sutures to facilitate a midline access through scar tissue. Subcutaneous and skin closures are performed as usual. Parkinson D. Replacement laminotomy. Surg Neurol. 1977 Oct. 8(4):277-9. [Medline]. Yucesoy K, Sonntag VK. Terminology confusion in spinal surgery: laminotomy, laminoplasty, laminectomy. J Neurosurg. 2000 Feb. 92(2):371. [Medline]. Nakamura K, Y. Toyama, et al. Cervical Laminoplasty. Tokyo, Springer-Verlag. 2003. Koda M, Mochizuki M, Konishi H, Aiba A, Kadota R, Inada T, et al. Comparison of clinical outcomes between laminoplasty, posterior decompression with instrumented fusion, and anterior decompression with fusion for K-line (-) cervical ossification of the posterior longitudinal ligament. Eur Spine J. 2016 Jul. 25 (7):2294-301. [Medline]. Casey ATH, A Crockarda. Advances in spinal stabilization. R. W. Haid, B. R. Subach and G. E. j. Rodts. Basel, Karger. Cervical Laminoplasty. 2003. 16:142-153. Kaye ID, Hilibrand AS, Morrissey PB, Vaccaro AR. Laminoplasty is the Preferred Procedure for a Posteriorly Based Multilevel Surgery in a Patient With a Neutral Spine and Cervical Spondylotic Myelopathy: True or False?. Clin Spine Surg. 2018 Feb. 31 (1):1-5. [Medline]. Raimondi AJ, Gutierrez FA, Di Rocco C. Laminotomy and total reconstruction of the posterior spinal arch for spinal canal surgery in childhood. J Neurosurg. 1976 Nov. 45(5):555-60. [Medline]. Kawahara N, Tomita K, Shinya Y, Matsumoto T, Baba H, Fujita T. Recapping T-saw laminoplasty for spinal cord tumors. Spine (Phila Pa 1976). 1999 Jul 1. 24(13):1363-70. [Medline]. Spetzger U, Bertalanffy H, Naujokat C, von Keyserlingk DG, Gilsbach JM. Unilateral laminotomy for bilateral decompression of lumbar spinal stenosis. Part I: Anatomical and surgical considerations. Acta Neurochir (Wien). 1997. 139(5):392-6. [Medline]. Spetzger U, Bertalanffy H, Reinges MH, Gilsbach JM. Unilateral laminotomy for bilateral decompression of lumbar spinal stenosis. Part II: Clinical experiences. Acta Neurochir (Wien). 1997. 139(5):397-403. [Medline]. Thome C, Zevgaridis D, Leheta O, Bazner H, Pockler-Schoniger C, Wohrle J. Outcome after less-invasive decompression of lumbar spinal stenosis: a randomized comparison of unilateral laminotomy, bilateral laminotomy, and laminectomy. J Neurosurg Spine. 2005 Aug. 3(2):129-41. [Medline]. Kwon YJ. Central decompressive laminoplasty for treatment of lumbar spinal stenosis : technique and early surgical results. J Korean Neurosurg Soc. 2014 Sep. 56(3):206-10. [Medline]. [Full Text]. Strong MJ, Thompson EM, Roundy N, Selden NR. Use of lumbar laminoplasty vs. laminotomy for transection of the filum terminale does not affect early complication rates or postoperative course. Childs Nerv Syst. 2015 Apr. 31 (4):597-601. [Medline]. Uchino A, Saito N, Takahashi M, Okada Y, Kozawa E, Nishi N, et al. Variations in the origin of the vertebral artery and its level of entry into the transverse foramen diagnosed by CT angiography. Neuroradiology. 2013 May. 55 (5):585-94. [Medline]. Kaminsky, S. B., C. R. Clark, et al. (2004). ". Operative treatment of cervical spondylotic myelopathy and radiculopathy. A comparison of laminectomy and laminoplasty at five year average follow-up." The Iowa orthopaedic journal 24: 95-105. Hersh DS, Iyer RR, Garzon-Muvdi T, Liu A, Jallo GI, Groves ML. Instrumented fusion for spinal deformity after laminectomy or laminoplasty for resection of intramedullary spinal cord tumors in pediatric patients. Neurosurg Focus. 2017 Oct. 43 (4):E12. [Medline]. Jiang YQ, Li XL, Zhou XG, Bian C, Wang HM, Huang JM, et al. A prospective randomized trial comparing anterior cervical discectomy and fusion versus plate-only open-door laminoplasty for the treatment of spinal stenosis in degenerative diseases. Eur Spine J. 2017 Apr. 26 (4):1162-1172. [Medline]. Ma L, Liu FY, Huo LS, Zhao ZQ, Sun XZ, Li F, et al. Comparison of laminoplasty versus laminectomy and fusion in the treatment of multilevel cervical ossification of the posterior longitudinal ligament: A systematic review and meta-analysis. Medicine (Baltimore). 2018 Jul. 97 (29):e11542. [Medline]. Ogawa Y, Toyama Y, Chiba K, Matsumoto M, Nakamura M, Takaishi H. Long-term results of expansive open-door laminoplasty for ossification of the posterior longitudinal ligament of the cervical spine. J Neurosurg Spine. 2004 Sep. 1(2):168-74. [Medline]. Lee CK, Shin DA, Yi S, Kim KN, Shin HC, Yoon DH, et al. Correlation between cervical spine sagittal alignment and clinical outcome after cervical laminoplasty for ossification of the posterior longitudinal ligament. J Neurosurg Spine. 2016 Jan. 24 (1):100-7. [Medline]. Sakai K, Yoshii T, Hirai T, Arai Y, Shinomiya K, Okawa A. Impact of the surgical treatment for degenerative cervical myelopathy on the preoperative cervical sagittal balance: a review of prospective comparative cohort between anterior decompression with fusion and laminoplasty. Eur Spine J. 2017 Jan. 26 (1):104-112. [Medline]. Takenaka S, Hosono N, Mukai Y, Tateishi K, Fuji T. Significant reduction in the incidence of C5 palsy after cervical laminoplasty using chilled irrigation water. Bone Joint J. 2016 Jan. 98-B (1):117-24. [Medline]. Vergara P. Minimally Invasive Microscopic Posterior Cervical Decompression: Simple, Safe, and Effective. J Neurol Surg A Cent Eur Neurosurg. 2017 Sep. 78 (5):440-445. [Medline]. Albert TJ, Vacarro A. Postlaminectomy kyphosis. Spine (Phila Pa 1976). 1998 Dec 15. 23(24):2738-45. [Medline]. Kode S, Kallemeyn NA, Smucker JD, Fredericks DC, Grosland NM. The effect of multi-level laminoplasty and laminectomy on the biomechanics of the cervical spine: a finite element study. Iowa Orthop J. 2014. 34:150-7. [Medline]. [Full Text]. Yasuoka S, Peterson HA, MacCarty CS. Incidence of spinal column deformity after multilevel laminectomy in children and adults. J Neurosurg. 1982 Oct. 57(4):441-5. [Medline]. Saito T, Yamamuro T, Shikata J, Oka M, Tsutsumi S. Analysis and prevention of spinal column deformity following cervical laminectomy. I. Pathogenetic analysis of postlaminectomy deformities. Spine (Phila Pa 1976). 1991 May. 16(5):494-502. [Medline]. Kothe R, Schmeiser G, Papavero L. Open-door laminoplasty : What can the unilateral approach offer?. Oper Orthop Traumatol. 2018 Feb. 30 (1):3-12. [Medline]. Gore DR, Sepic SB, Gardner GM. Roentgenographic findings of the cervical spine in asymptomatic people. Spine (Phila Pa 1976). 1986 Jul-Aug. 11(6):521-4. [Medline]. Mikawa Y, Shikata J, Yamamuro T. Spinal deformity and instability after multilevel cervical laminectomy. Spine (Phila Pa 1976). 1987 Jan-Feb. 12(1):6-11. [Medline]. Nowinski GP, Visarius H, Nolte LP, Herkowitz HN. A biomechanical comparison of cervical laminaplasty and cervical laminectomy with progressive facetectomy. Spine (Phila Pa 1976). 1993 Oct 15. 18(14):1995-2004. [Medline]. Hou Y, Liang L, Shi GD, Xu P, Xu GH, Shi JG, et al. Comparing effects of cervical anterior approach and laminoplasty in surgical management of cervical ossification of posterior longitudinal ligament by a prospective nonrandomized controlled study. Orthop Traumatol Surg Res. 2017 Sep. 103 (5):733-740. [Medline]. [Full Text]. Machino M, Yukawa Y, Hida T, Ito K, Nakashima H, Kanbara S, et al. Cervical alignment and range of motion after laminoplasty: radiographical data from more than 500 cases with cervical spondylotic myelopathy and a review of the literature. Spine. 09/2012. 37:1243-50. [Medline]. Woods BI, Hohl J, Lee J, Donaldson W 3rd, Kang J. Laminoplasty versus laminectomy and fusion for multilevel cervical spondylotic myelopathy. Clin Orthop Relat Res. 03/2011. 469:688-95. [Medline]. Cunningham MR, Hershman S, Bendo J. Systematic Review of cohort studies comparing surgical treatments for cervical spondylotic myelopathy. Spine. 03/2010. 35:537-43. [Medline]. Varthi AG, Basques BA, Bohl DD, Golinvaux NS, Grauer JN. Perioperative Outcomes after Cervical Laminoplasty versus Posterior Decompression and Fusion: Analysis of 779 Patients in the ACS-NSQIP Database. J Spinal Disord Tech. 2014 Oct 10. [Medline]. 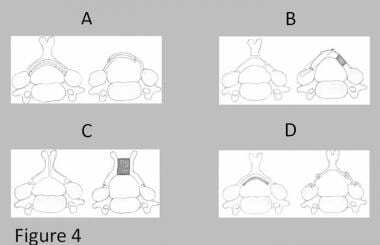 Aizawa T, Sato T, Ozawa H, Morozumi N, Matsumoto F, Sasaki H. Sagittal alignment changes after thoracic laminectomy in adults. J Neurosurg Spine. 2008 Jun. 8(6):510-6. [Medline]. Shenkin HA, Hash CJ. Spondylolisthesis after multiple bilateral laminectomies and facetectomies for lumbar spondylosis. Follow-up review. J Neurosurg. 1979 Jan. 50(1):45-7. [Medline]. Cuéllar JM, Field JS, Bae HW. Distraction Laminoplasty With Interlaminar Lumbar Instrumented Fusion (ILIF) for Lumbar Stenosis With or Without Grade 1 Spondylolisthesis: Technique and 2-Year Outcomes. Spine (Phila Pa 1976). 2016 Apr. 41 Suppl 8:S97-S105. [Medline]. Bell DF, Walker JL, O'Connor G, Tibshirani R. Spinal deformity after multiple-level cervical laminectomy in children. Spine (Phila Pa 1976). 1994 Feb 15. 19(4):406-11. [Medline]. McGirt MJ, Chaichana KL, Atiba A, Bydon A, Witham TF, Yao KC. Incidence of spinal deformity after resection of intramedullary spinal cord tumors in children who underwent laminectomy compared with laminoplasty. J Neurosurg Pediatr. 2008 Jan. 1(1):57-62. [Medline]. Raab P, Juergen K, Gloger H, Soerensen N, Wild A. Spinal deformity after multilevel osteoplastic laminotomy. Int Orthop. 2008 Jun. 32(3):355-9. [Medline]. Amhaz HH, Fox BD, Johnson KK, Whitehead WE, Curry DJ, Luerssen TG. Postlaminoplasty kyphotic deformity in the thoracic spine: case report and review of the literature. Pediatr Neurosurg. 2009. 45(2):151-4. [Medline]. Veeravagu A, Azad TD, Zhang M, Li A, Pendharkar AV, Ratliff JK, et al. Outcomes of cervical laminoplasty-Population-level analysis of a national longitudinal database. J Clin Neurosci. 2018 Feb. 48:66-70. [Medline]. Husain, AM. A Practical Approach to Neurophysiological Intraoperative Monitoring. Demos Medical Publishing: 2008. Connolly E S, G. McKhann II, et al. Fundamentals of Operative Techniques in Neurosurgery. New York: Thieme; 2010. Hida T, Sakai Y, Ito K, Ito S, Imagama S, Ishiguro N, et al. Collar Fixation Is Not Mandatory After Cervical Laminoplasty: A Randomized Controlled Trial. Spine (Phila Pa 1976). 2017 Mar. 42 (5):E253-E259. [Medline]. Cheung JPY, Cheung PWH, Law K, Borse V, Lau YM, Mak LF, et al. Postoperative Rigid Cervical Collar Leads to Less Axial Neck Pain in the Early Stage After Open-Door Laminoplasty-A Single-Blinded Randomized Controlled Trial. Neurosurgery. 2018 Aug 3. [Medline]. Ratliff JK, Cooper PR. Cervical laminoplasty: a critical review. J Neurosurg. 2003 Apr. 98(3 Suppl):230-8. [Medline]. Fang Z, Tian R, Sun TW, Yadav SK, Hu W, Xie SQ. Expansion Open-door Laminoplasty With Foraminotomy Versus Anterior Cervical Discectomy and Fusion for Coexisting Multilevel Cervical Myelopathy and Unilateral Radiculopathy. Clin Spine Surg. 2016 Feb. 29 (1):E21-7. [Medline]. Seichi A, Takeshita K, Ohishi I, Kawaguchi H, Akune T, Anamizu Y. Long-term results of double-door laminoplasty for cervical stenotic myelopathy. Spine (Phila Pa 1976). 2001 Mar 1. 26(5):479-87. [Medline]. McGirt MJ, Garces-Ambrossi GL, Parker SL, Sciubba DM, Bydon A, Wolinksy JP. Short-term progressive spinal deformity following laminoplasty versus laminectomy for resection of intradural spinal tumors: analysis of 238 patients. Neurosurgery. 2010 May. 66(5):1005-12. [Medline]. Ahmady A, Sadowski K, Furey CG. Axial Neck Pain following Posterior Cervical Spine Surgery: Laminoplasty vs Laminectomy and Fusion. The Spine Journal. 2017 Oct. 17:S209. [Full Text]. Kimura A, Shiraishi Y, Inoue H, Endo T, Takeshita K. Predictors of Persistent Axial Neck Pain After Cervical Laminoplasty. Spine (Phila Pa 1976). 2018 Jan 1. 43 (1):10-15. [Medline]. Mesfin A, Park MS, Piyaskulkaew C, Chuntarapas T, Song KS, Kim HJ, et al. Neck Pain following Laminoplasty. Global Spine J. 2015 Feb. 5 (1):17-22. [Medline]. Hosono N, Yonenobu K, Ono K. Neck and shoulder pain after laminoplasty. A noticeable complication. Spine (Phila Pa 1976). 1996 Sep 1. 21(17):1969-73. [Medline]. Imagama S, Matsuyama Y, Yukawa Y, Kawakami N, Kamiya M, Kanemura T. C5 palsy after cervical laminoplasty: a multicentre study. J Bone Joint Surg Br. 2010 Mar. 92(3):393-400. [Medline]. Ando M, Tamaki T, Matsumoto T, Maio K, Teraguchi M, Takiguchi N, et al. Can postoperative deltoid weakness after cervical laminoplasty be prevented by using intraoperative neurophysiological monitoring?. J Clin Monit Comput. 2019 Feb. 33 (1):123-132. [Medline]. Tsuji T, Matsumoto M, Nakamura M, Ishii K, Fujita N, Chiba K, et al. Factors associated with postoperative C5 palsy after expansive open-door laminoplasty: retrospective cohort study using multivariable analysis. Eur Spine J. 2017 Sep. 26 (9):2410-2416. [Medline]. Metz LN, Arutyunyan G, Jain D, Tan LA. Cervical Laminoplasty. Kaiser M, Haid R, Shaffrey C, Fehlings M. Degenerative Cervical Myelopathy and Radiculopathy. Cham: Springer; 2019 Jan. 207-20. [Full Text]. Michael KW, Neustein TM, Rhee JM. Where should a laminoplasty start? The effect of the proximal level on post-laminoplasty loss of lordosis. Spine J. 2016 Jun. 16 (6):737-41. [Medline]. Mielke D, Rohde V. Bilateral spinal canal decompression via hemilaminectomy in cervical spondylotic myelopathy. Acta Neurochir (Wien). 2015 Oct. 157 (10):1813-7. [Medline]. Otani K, Iwabuchi M, Sato K, Konno S, Kikuchi S. Postoperative neck symptoms of posterior approach for cervical compressive myelopathy: Expansive open-door laminoplasty vs. segmental partial laminectomy. Fukushima J Med Sci. 2018 Aug 29. 64 (2):54-59. [Medline]. Neuschmelting V, Fathi AR. Suspended laminoplasty. J Neurosurg Spine. 2008 Feb. 8(2):201; author reply 202. [Medline]. Oyama MS, Hattori, et al. A new method of cervical laminectomy. Chubuseisaisi (Jpn). 1973. 16:792-794. Kawai S, Sunago K, Doi K, Saika M, Taguchi T. Cervical laminoplasty (Hattori's method). Procedure and follow-up results. Spine (Phila Pa 1976). 1988 Nov. 13(11):1245-50. [Medline]. Hirabayashi, K. Expansive open-door laminoplasty for cervical spondylotic myelopathy. Jpn J Surg 32. 1978. 1159-1163. Noguchi H, Koda M, Funayama T, Kumagai H, Saito J, Mannoji C, et al. Regenos spacers are not suitable for open-door laminoplasty because of serious adverse events caused by their insufficient mechanical strength. J Clin Neurosci. 2018 Oct. 56:50-55. [Medline]. Kurokawa T, H Tanaka et al. Enlargement of the spinal canal by the sagittal splitting of the spinous process." Bessatsu Seikeigeka 2. 1982. 234-240. Hirabayashi S, Kumano K. Contact of hydroxyapatite spacers with split spinous processes in double-door laminoplasty for cervical myelopathy. J Orthop Sci. 1999. 4(4):264-8. [Medline]. Jagannathan J, Sherman JH, Szabo T, Shaffrey CI, Jane JA. The posterior cervical foraminotomy in the treatment of cervical disc/osteophyte disease: a single-surgeon experience with a minimum of 5 years' clinical and radiographic follow-up. J Neurosurg Spine. 2009 Apr. 10(4):347-56. [Medline]. Chen H, Liu H, Zou L, Li T, Gong Q, Song Y, et al. Effect of Mini-plate Fixation on Hinge Fracture and Bony Fusion in Unilateral Open-door Cervical Expansive Laminoplasty. Clin Spine Surg. 2016 Jul. 29 (6):E288-95. [Medline]. Humadi A, Chao T, Dawood S, Tacey M, Barmare A, Freeman B. A Meta-Analysis of Cervical Laminoplasty Techniques: Are Mini-Plates Superior?. Global Spine J. 2017 Jun. 7 (4):373-381. [Medline]. Qi Q, Li L, Luo J, Huang S, Zhou Z, Gao M, et al. Is Mini-Plate Fixation Superior to Suture Suspensory Fixation in Cervical Laminoplasty? A Meta-Analysis. World Neurosurg. 2016 Sep. 93:144-53. [Medline]. Hida S, Naito M, Arimizu J, Morishita Y, Nakamura A. The transverse placement laminoplasty using titanium miniplates for the reconstruction of the laminae in thoracic and lumbar lesion. Eur Spine J. 2006 Aug. 15(8):1292-7. [Medline]. Adachi K, Futami T, Ebihara A, Yamaya T, Kasai N, Nakazawa T. Spinal canal enlargement procedure by restorative laminoplasty for the treatment of lumbar canal stenosis. Spine J. 2003 Nov-Dec. 3(6):471-8. [Medline]. Liu FY, Yang SD, Huo LS, Wang T, Yang DL, Ding WY. Laminoplasty versus laminectomy and fusion for multilevel cervical compressive myelopathy: A meta-analysis. Medicine (Baltimore). 2016 Jun. 95 (23):e3588. [Medline]. Table 2. Overview of the most common indications for laminoplasty. The K-line is positive when the peak of OPLL does not exceed the K-line, and negative when the peak of OPLL exceeds the K-line. The authors thank Ftaima Belabes for technical assistance, Dr. Enrico Tessitore for intraoperative photographs, and Dr. Bixia Chen for providing the illustrations.